At Marlo’s Crochet Corner I eventually found instructions on how to cut a plastic bag to get the ‘yarn’ for crocheting and/or knitting. 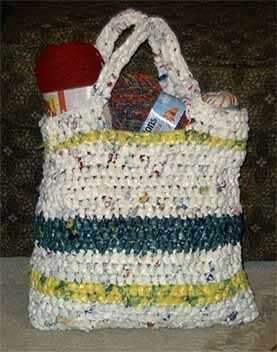 She also provides an instruction on how to crochet a tote. The purse was quite stiff (which I find appropriate for a purse ;-)). I think about making plastic yarn (plarn) and working freeform with it, but I still have no idea what to make, because items knitted of crocheted with plastic bag yarn tend to get big. 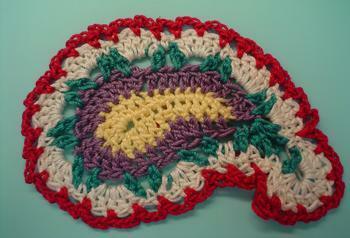 Yesterday I presented a tutorial on Bead embroidered Paisleys. If you like Paisleys too but look for another technique to create them try Crocheted Paisleys Crocheted Paisleys. One day I will make a shawl by crocheting lots and lots of those Paisleys and sewing them together! 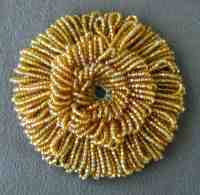 I showed before a tutorial on crocheting bead ropes. These bead crochet instructions are different: this time you crochet something like a completely beaded fabric which you can use further for your projects. Use it e.g. for little purses. It was a real revelation for me because eventually I understood how it works. 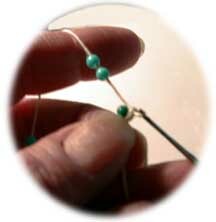 Since I have found this knot at Bead-Patterns.com my self-made items look much more better. The knot is easy, fast and slim, it is almost invisible and I use it nearly everywhere: to connect the yarns at knitting and crocheting and to connect threads while beading.